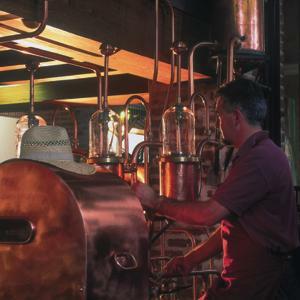 The distillation operation begins with filling the pots with fermented marc and then heating it. This initial stage allows the evaporation of the volatile substances such as alcohol and a part of the water. Ethyl alcohol, the main substance making up a distillate, boils at 78.4°C and not at 100°C like water. However, as the ethyl alcohol is in a solution with water, the boiling point varies according to its quantity with respect to the water. The more the water, the higher the boiling point. In the marc to be distilled there are, however, other volatile components which evaporate during the heating and are transferred in the distilled liquid. Many of these substances are unpleasant and unwanted, and must be eliminated. Fortunately, the various volatile substances in the marc evaporate at different temperatures. Therefore, by carefully controlling the distilling process the unwanted components can be eliminated while maintaining all the substances of quality. This separation, or elimination, of the unpleasant and unwanted substances is called rectification and is obtained by removing the heads and tails of the distillate. The alcoholic vapours produced by heating and by the successive concentration, are subsequently cooled and brought to the liquid state, giving rise to the distilled product. The distillate is divided in three parts according to its components and its quality: the head, the heart and the tail. The head is the first part of the distilled liquid to be produced and mainly contains unpleasant substances that would give the Grappa an unpleasant sour taste, as well as methyl alcohol, which is toxic, and therefore to be eliminated. Fortunately, these substances have a lower evaporation point than the "noble" substances of the Grappa, and therefore are the first to be produced. The skill of the distiller consists of the ability to establish when the head of the distillate ends and when the so-called heart, i.e. the best part of the Grappa rich in ethyl alcohol and aromatic substances, starts to come out. The distiller's skill is also judged by his ability to recognise the end of the heart and the start of the tail, i.e. the last part of the distillate which will be eliminated from the Grappa, since it contains unpleasant fatty and oily substances. Therefore, Grappa is obtained by selecting the heart, i.e. the middle part of the distillation, rich in ethyl alcohol and pleasant aromatic substances, and discarding the head and tail, i.e. the first and last parts of the distillation process.